This work probes the problem of suffering as it is presented to us in the Book of Job. Here we find the enmity between the two seeds which underlies the problem of the ages, and the over-ruling grace of God bending all things to the accomplishing of His ‘end result', so that the sufferer will finally ‘come forth as gold'. In this book, C.H. 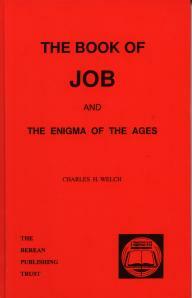 Welch sheds much light on the great unfolding purpose of the ages. We are here brought face to face, not only with the problem of suffering, but with the problem of evil and its relation to the creation of man. He who would stand fast amid the pressure of events must learn the lessons taught in this great book of Job. At the outset we are brought to the very heart of things. The author draws back the curtain and shows how this ancient record came into the hands of one ‘learned in all the wisdom of the Egyptians’. Here, Moses would read for the first time truths that form part of the book of Genesis; Adam’s sin, the Sons of God, the majesty of the Creator and the vastness of His handiwork. Not only so, but here he would read of a Redeemer who lived, of a Ransom provided, and of a hope that through Him man may be raised from sleep in the dust of the earth. The conclusion is inescapable that such a book would not only influence but impart power and wisdom to the man chosen to be the deliverer and lawgiver of Israel. To many the book of Job is a record of unrelieved gloom, with Job longing to be where ‘the wicked cease from troubling, and the weary are at rest’. This however is only part of the truth revealed. Suffering is answered by comfort and consolation, reproach and loss give place to honour and blessing. The fruits of victory are given to one who by his faith endured and overcame. The reader’s conviction steadily deepens that the truth of this ancient book applies in principle to his own day. In conclusion, we find here keys to unlock some of life’s enigmas: Genesis 3 will be read with new understanding, and the veil is drawn aside as we see the adversary of man in his corrupting, spoiling work. Not only do we perceive the cause of Job’s sufferings, but we are enabled to view the history of Israel in a fresh light. Though God may speak in divers ways and manners, we perceive one underlying purpose, a consistent unity and integrity throughout the inspired range of revealed truth. Here indeed is a work that will build up the believer and give an inheritance among all that are sanctified.